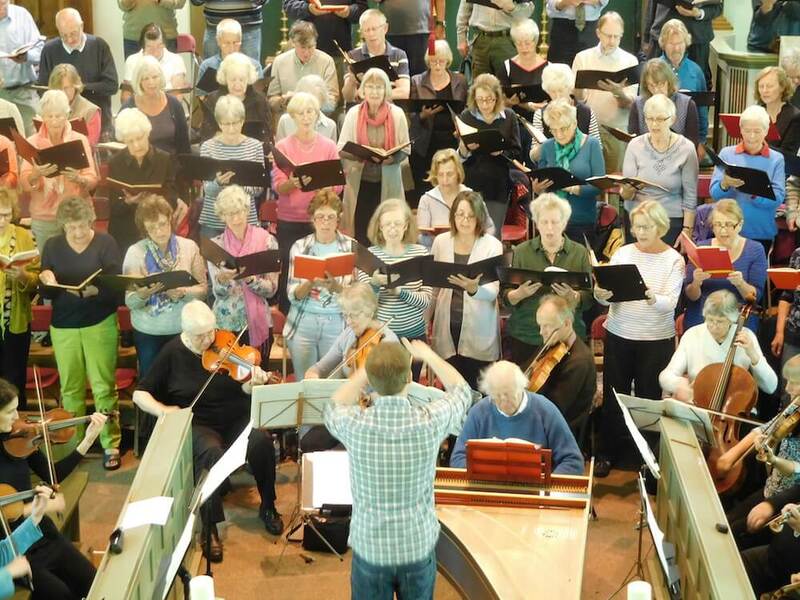 The New Elizabethan Singers was founded in 1966 by the late Bruce Critchinson, and has since grown to become the largest choir in West Dorset. Many of our concerts feature an orchestra, drawing on some of the finest players the county has to offer, and over the years we've had the privilege of working with some wonderful professional soloists. The choir is conducted by Matt Kingston. Our accompanist is Nick Brown. Matt joined NES as conductor in 2011, and has introduced the choir to many new and unfamiliar works, alongside the usual repertoire. In recent years we've given only the third UK performance of a neglected Baroque masterpiece - Heinrich Biber's epic Missa Salisburgensis, and the fourth performance of Paul Carr's wonderful Seven Last Words. Matt has been involved in choral music since he was six years old, when he joined his local church choir. Both his grandfather and great-grandfather were organists and choirmasters, so it wasn’t long before Matt joined the family firm! Matt is music arranger by trade, and one of the UK’s most prolific arrangers of brass music, specialising in music for junior bands and for brass quintets. He has written and published over 500 arrangements, with performances in more than 50 countries. In recent years Matt has begun to write choral music (using the pen name Matthew Coleridge - the surname of his grandfather). His first composition, the Corpus Christi Carol, appeared on BBC Music Magazine’s Christmas CD in 2015. His first large-scale work, Requiem, premiered in October 2015 and has since received numerous performances in the UK and Europe. 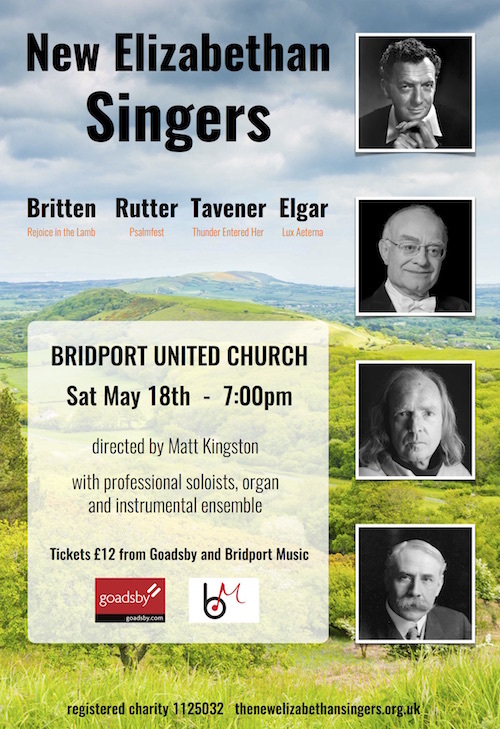 Tickets £12, available from Goadsby Estate Agents and Bridport Music. Equally unusual is John Tavener’s Thunder Entered Her. Those familiar with Tavener’s The Lamb will recognise his deep interest in religious mysticism and here he takes the 4th century poetry of St Ephrem The Syrian to reflect the awe and wonder of the birth of Christ. The music is reminiscent of the Eastern Orthodox church and the fantastically low basso profundo notes will provide a particular challenge for the basses! Last but not least is a piece very well known by most of us as Nimrod from Edward Elgar’s Enigma Variations. Famous for his film compositions and adaptions, John Cameron has adapted this classic orchestral work into an eight- part choral piece to the words of Lux Aeterna from the Latin Requiem mass. Not so celebratory perhaps, but a deeply satisfying sing! 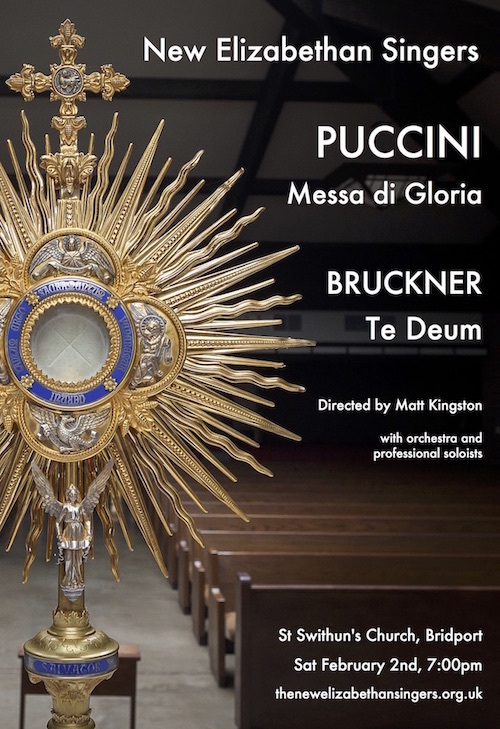 Puccini's colourful and operatic Mass, alongside Bruckner's monumental Te Deum. With chamber orchestra and four professional soloists, this concert promises to be a joyous festival of Late Romantic choral works. Imagine going to a Puccini opera, but discovering a Mass had been substituted at the last minute! Last Saturday the New Elizabethan Singers performed just such a work, The “Messa da Gloria” of 1880, written by teenage Puccini as his graduation piece, and with more than a nod to Verdi. The young Italian used every trick in the musical book to showcase his emerging genius – dramatic changes in SPEED, in dynamics; triplets set against duplets; florid solos (the tenor Alberto Sousa was on exceptional form); luscious harmonies that wrapped round us like a warm blanket on a freezing evening. The choir was on top form – well drilled, attentive to conductor Matt Kingston, with clear enunciation and absolutely together, even on difficult and exposed entries. By contrast Bruckner’s Te Deum of 1884 came across as a far more introspective work. Eschewing Italian flourishes, the music dutifully echoed the Te Deum prayer (“We praise Thee, O Lord”. However, this did not make it an easy piece to sing. Very high top notes taxed the sopranos, and sliding chromatic sections meant that both choir and orchestra had to pitch their notes precisely. Soloists Katharine Fuge and Emily Hicks blended their voices perfectly to produce an ethereal contrast to Ricardo Panela and Alberto Sousa’s anchoring in the lower range. The orchestra, under Alexandra Ennis, coped sturdily with a taxing score. Four years apart in composition; aeons apart in style, these works are relatively little known to modern audiences. All credit to the Elizabethans for educating as well as entertaining us with such a stylish performance. In addition to our concerts, we often perform in smaller groups at functions and special occasions. Recent engagements have included 14 singers for a wedding at Milton Abbey, and seven of us carol singing at Seaside Boarding House. © New Elizabethan Singers. All rights reserved.